According to the pollster Alvara, one in five Indonesian students favour the establishment of an Islamic Caliphate; one in three don't approve of non-Muslims leading Muslims. Research undertaken by the Setara Institute indicates that Jakarta is now the least religiously tolerant city in the country. This intolerance is often attributed to the race-baiting and religious tension that characterised the election for governor in Jakarta in April, which saw the Chinese Christian incumbent Ahok lose to Anies Baswedan. Baswedan's supporters targeted Ahok's Christianity, asserting that the Koran forbids Muslims from being ruled by non-Muslims. A blasphemy charge was fabricated against Ahok, which later lead to his jailing. Baswedan, who offered little policy pronouncements of note other than that he was a Sunni Muslim, won over 60% of the vote. The election was closely followed by Islamic State-inspired suicide bombings on 25 May that killed three police officers. Many observers of Indonesian affairs see these events as linked. The increasing persecution of minorities and rise in terrorist attacks is characterised as reflective of an increasing radicalism; Indonesia, once lauded as a beacon of 'tolerant' Islam, may go the way of the caliphate. The Islamic State uprising in Marawi is seen as a portent of things to come in Indonesia. The reality is more complex. In a trend that began under then-president Susilo Bambang Yudhoyono's first term, intolerant strains of Sunni Islam have increasingly been used as electoral tools. Politicians across the Sunni Muslim-majority areas of the archipelago have campaign on Islamic piety, and numerous sharia-inspired local regulations and bylaws passed, most of them contradicting Indonesia's constitution and secular identity. This radicalisation has been accompanied by demands that Indonesia 'return' to the originally proposed 1945 constitution, which would apply Sharia to Muslims. Through Yudhoyono's second term, churches in Muslim areas of Jakarta were shuttered, and in the national curriculum, science ceded ground to religion. The Islamic Defenders Front, a gang of extortionists with an Islamic flavour, increased raids on food-sellers during Ramadan and closed bars (but not the bars that 'donated' to them). Shia Muslims and Ahmadiyah were persecuted and driven from their homes. These local trends deepened alongside even more worrying ones: twin bombings in Jakarta hotels in 2009 killed nine and injured 50. An al-Qaeda inspired camp was uncovered in Aceh in 2010 after several failed attacks on foreigners. Bombing plots were uncovered in Sumbawa; an Islamist insurgency simmered in central Sulawesi, and across Java, cells of young radicals targeted police in actions more akin to gang skirmishes than jihad. Indonesians joined Islamic State in Syria, with some returning to carry out attacks in Jakarta in January 2016, killing two civilians. 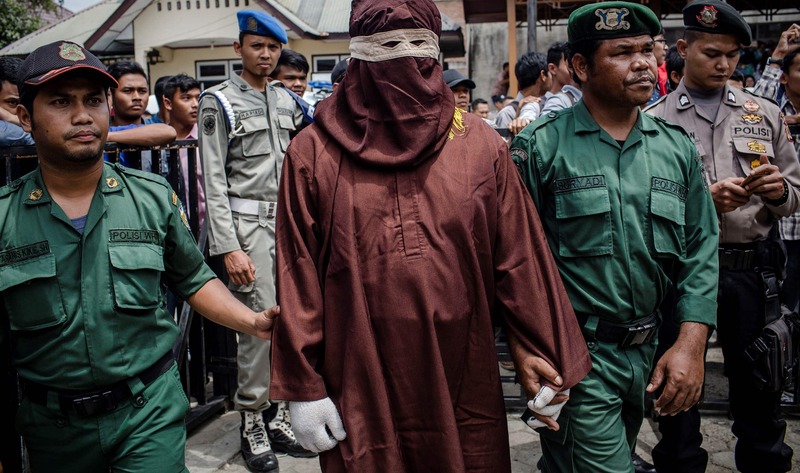 But while aspects of Sunni Islam are increasingly persecutorial in Indonesia, the link between this intolerance and the Islamic State's brutal millenarian nihilism is, for now, tenuous. While many young radicals who began persecuting Ahmadiyah have gone on to kill police or travel to Syria, nearly all do not. This intolerance decoupled from millenarianism is reflective of how Islam is used in Indonesian politics; the Yaumul Qiyamah, or end of days, is not discussed by politicians or their imam allies. They denounce rival politicians, steer votes, and ensure the obedience of local communities by preaching vigilance against immorality and the fictitious encroachment of other religions. Such an approach is geared toward electing politicians based on their ability to recite Koranic passages rather than their non-religious policy platforms. Islam is the answer to everything, especially if one has no other answer. Threats to business and investment are predatory, not extremist – and a recent constitutional court ruling that the Ministry of Home Affairs does not have the right to rescind new local regulations unilaterally will surely increase rent-seeking by local politicians. This will increase instability far more than recent attacks. The future of Islam in Sunni-majority areas of Indonesia is not Islamic State. Aceh, on the northern tip of Sumatra, is a more likely scenario. It is the only province where many (but not all) aspects of Sharia are law, and are applied to both Muslims and non-Muslims. The Sharia enforcement agency, the Wilayatul Hizbah, raids homes and restaurants, searching for alcohol, unmarried men and women in suspicious proximity to each other, and so on. That force generally specialises in the harassment of women and the poor, and its members have committed multiple rapes. The stifling atmosphere of prescribed piety in Aceh encourages vigilantism; mobs police their own neighbourhoods, beating offenders and handing them over to religious courts for caning as local newspapers glorify the entire process. All this serves to integrate ordinary citizens into what are essentially religious surveillance networks. It is this atmosphere that many local politicians outside of Aceh seek to emulate. As this oppression is labelled Islamic, many a Sunni Muslim is afraid to vote otherwise. While Aceh is more likely a future than Raqqa, the latter is a possibility that should not be discounted in some parts of the archipelago. The political weaponisation of Sunni Islam leads to an ecclesiastical arms race amongst adversaries, opening the door wider to conspiracy, persecution and the millenarian path toward paradise. In the medium term, religious minorities and secularists may suffer, as could a wider Sunni electorate that feels compelled to vote for Islamic piety and an opaque culture of corruption over good governance. Radicals will continue their bizarre 'gang war' against the police; attacks, especially suicide bombings, will likely increase. A few jihadis will survive the Islamic State collapse and return home with the experience and ability to execute complex, large-scale attacks. The anti-terrorist police unit Densus 88 will likely kill most sooner or later, just as they did to Noordin Top and the previous Jemaah Islamiyah generation that committed the 2002 and 2005 Bali bombings. But these terrorists are generally separate from a prevailing fundamentalism, whose practitioners draw a line between themselves and suicide bombings. The Indonesian purveyors of this contradiction inherited it from Wahhabi Islam, which was proclaimed across the Sunni Indonesian political spectrum as a model of 'tolerance' during Saudi Arabia's King Salman's visit to the country in May this year. The 20% of students who support a caliphate is a concern, especially those who support jihad to achieve it. Those surveys were conducted in elite schools; one can't help but compare these attitudes to the beliefs that drove elite young men from rich families in Bangladesh to carry out the July 2016 attack on a restaurant in Dhaka, killing 22 hostages and two police. Meanwhile, in Indonesia's Christian east, Christians wonder what place they have in a country that looks increasingly 'Islamic'. The turn against secularism in the nation's west may serve to strengthen weak separatist movements in the east, and may lead to more violent sectarian conflicts along the Muslim-Christian fault lines in Central Sulawesi, Maluku and Maluku Utara, where communal violence flourished for years after the fall of the Suharto dictatorship. Papua is prone to such conflict as well; the 2015 burning of a mosque in Tolikara led to calls in Jakarta for Muslims to travel to the area to 'defend' their co-religionists there. In these places, extremist militias, both Muslim and Christian, can grow quickly in soil fertilised first by rhetoric, and later with blood. China's huge bilateral surplus with the United States - well over $300 billion each year - means it is high on the President's 'to do-over' list.